I recently watched Into Great Silence, a documentary about the lives of Carthusian monks at the Grande Chartreuse monastery in France. Each monk lives as a hermit in their own cell within the monastery. Each cell includes their living area as well as a small work room. This workbench appeared for only a few seconds in the film. Unfortunately, the quality of the video I was watching was not great and this was the best that I could do for a screen capture. The bench top appears to be only about two inches thick. The leg vice is missing but you can clearly see both the tap for the screw and the lower mortise for the guide. There is a hanging drawer to the right on runners. In addition, there appears to be a wooden planing stop hanging down from the left side. I wasn’t able to identify the machinery sitting on top of the bench, but it appears wholly unrelated to woodworking. I’ve searched a bit online and haven’t been able to find much in the way of additional photographs inside the workroom of a cell. A few photographs appeared to depict staged spaces in old monasteries that are open to the public as museums. However no one appeared to be interested in the workroom as photographs showed just the living quarters. 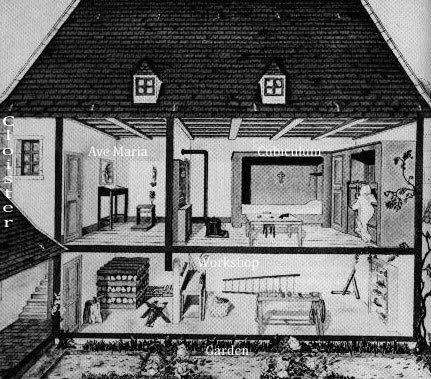 The drawing here appears to depict not only a workbench in the workroom on the first floor, but also a treadle lathe. These lathes appear to be standard issue for the monks. 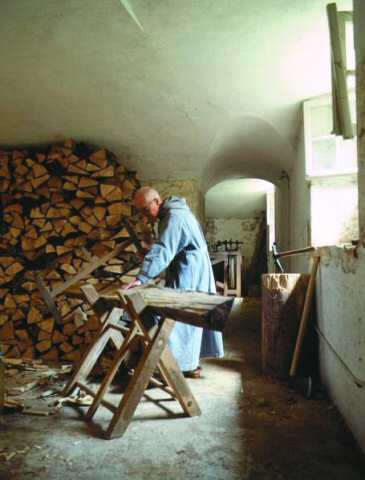 In this photograph from the Order’s website (apparently even hermit monks have a website), you can see a lathe in the background.